15-years anniversary show with Visions Of Atlantis! Good news! We are honoured to be part of the 15-years anniversary show of our colleagues from Vision Of Atlantis! 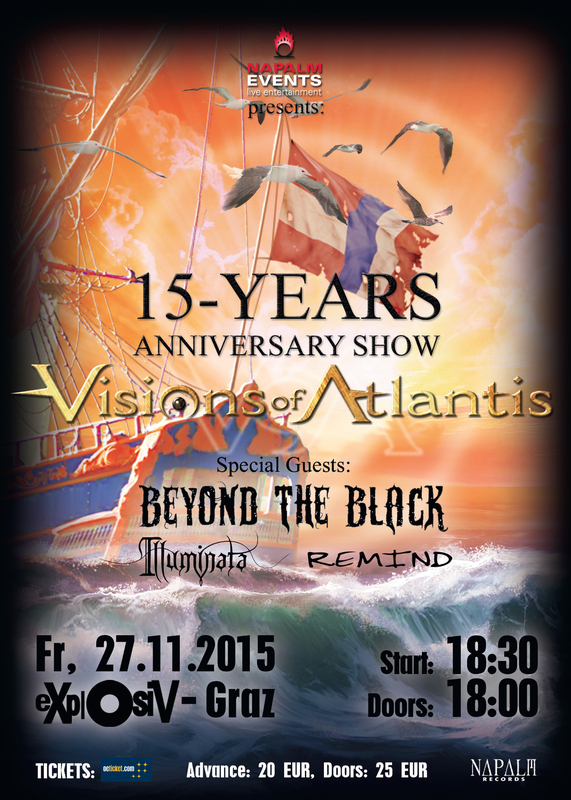 Looking forward to an awesome evening together with Visions Of Atlantis, Beyond The Black and Remind! See you there! We added a new ‘Polls’ section to our homepage! The first thing we want to know is: Where did you discover Illuminata? You can vote here! There is currently a band-voting going on at grazer.at. The two bands with the most votes will get a slot at this year’s Seerock Festival and will be able to share the stage with Judas Priest. Please help us by voting for Illuminata! Did you know that there also exists an instrumental version of our album ‘Where Stories Unfold’? Dive deeper into our music and be able to perceive every bit of the orchestrations and arragements, they were crafted with the utmost effort and keen eye for detail. Now relax, close your eyes and enjoy an imaginative walk through the woods of Pandora. We kindly provide the soundtrack with the orchestral version of our song ‘Entwined’! Feel free to share this post with your friends and to follow uns on Soundcloud! P.S. : The instrumental version of the album is available on iTunes, Amazon and from our Webshop. New CD-bundle added to shop! We added a new bundle to our webshop! Now you can get our album ‘A World So Cold’ + our new release ‘Where Stories Unfold’ for only 19,99€! That’s more than 2 hours of music! The bundle also includes 2 stickers and one autographed card! Worldwide shipping!